We at Carpenter Oak champion the use of timber above all other building materials. We also champion other organisations that have timber at the heart of everything they do. We recently met one such group of people in Dartington, close to our Devon yard, The Woodland Presents. Even on a wet, grey morning, as we followed the paths and signs that led us deeper into woods originally planted for the Dartington Estate, it’s impossible not feel intoxicated by the smells, sounds and beauty of your surroundings. As you get closer, the various spaces and structures come into view that The Woodland Presents now quietly and without imposition, occupies. The Glade, as it’s known, immediately feels considered, welcoming, and organic. As destinations, Dartington and nearby Totnes have a reputation for doing things differently. ‘Alternative’ is often used as a blanket term, ‘new-age’ another that misrepresents the brand of collective outlook and ethos that draws like minded people to the area. It’s clear very quickly, that the people behind The Woodland Presents are not driven by an alternative agenda, but they do try to work on behalf of local trees and woods and support and bring together people who work with them. The mission manifests itself in several ways that are already up and running, as well as plans for the future. 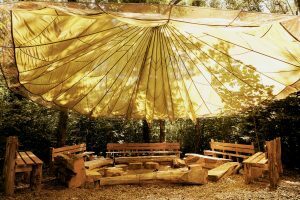 The Glade is available to hire for events and courses throughout the year, currently offering educational groups from the age of three upwards, poetry workshops, craft skills and more holistic sessions. There is also a varied scope of pop-up events that they host to help support their mission. 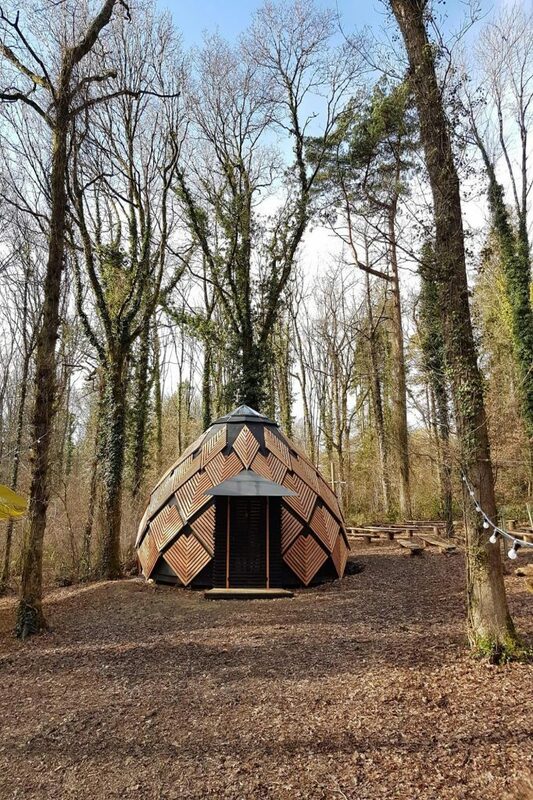 These have included music events, private gatherings and showcasing local food businesses, giving them a woodland backdrop and putting the Glade on the map as a local venue. 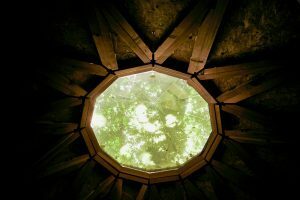 The centrepiece of the Glade sits like an embedded pine cone on the forest floor – the Nest. 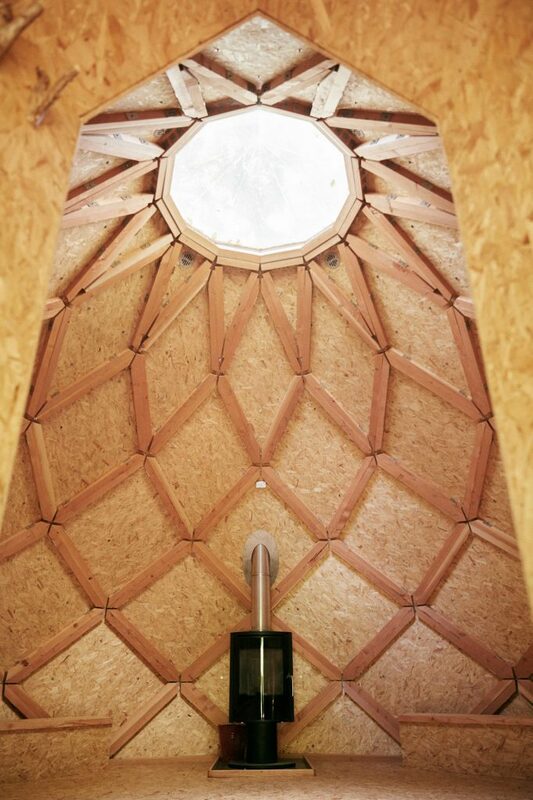 A simple, beautiful structure built by Workshop Collective Ltd that has a tactile outer shell and a tardis like space inside that can seat up to fifty people. 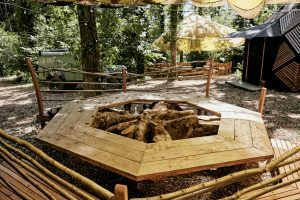 There are also areas nestled under parachute silk that provide a natural setting for outdoor eating, bars and the many courses and sessions. On the horizon, an ambitious project to replace a dilapidated structure and make use of a prime clearing in the woodland. Wood Lab will be a building inspired by the growing community workshops around the country that encourage people to share work space, learn from each other and make things! Promising modern machinery and facilities to work in, Wood Lab feels like the meaty end of the enterprise, that will put the making and teaching element of the mission into action on a larger scale. 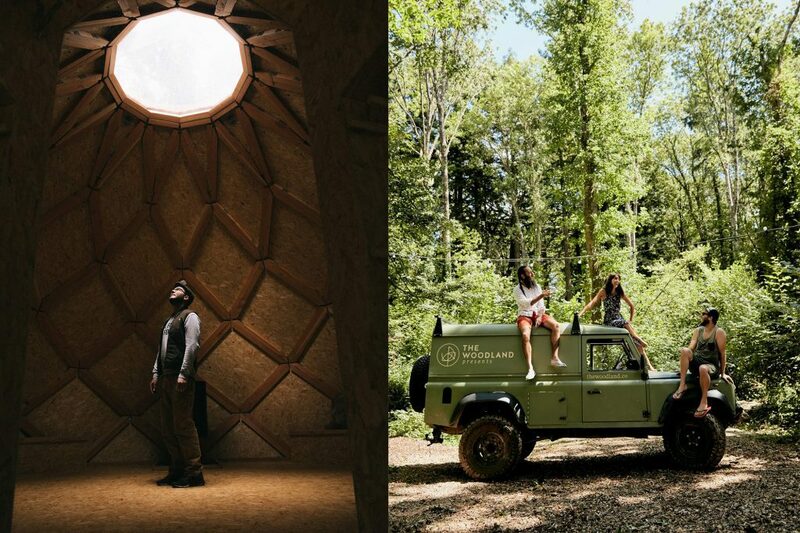 The Woodland Presents reinvest any profit they make into the care and creation of new woodland. This year they will be setting up a tree nursery in order to grow and plant over 10,000 native trees per year. They are currently engaging with land-owners who would like trees planting on their land. 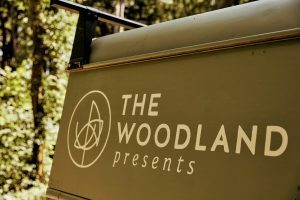 An enterprise like The Woodland Presents relies on support and collaboration from anyone else who believes that ‘wood is good.’ To find out more about them or to offer your help, get in touch.